Agnes and Albin have done everything right in their 20 year marriage to raise their sons. Illness now besets them and they are in need of a sponsor’s help. With your sponsorship, Agnes and Albin could continue to support their children in education and make necessary repairs to their home. Agnes and Albin have been married for more than twenty years and have worked hard to raise their two children. Their son, Sanju, is bright and hard-working. He graduated from school and has just completed a management course. Their daughter Amala is in 8thgrade and works hard at her studies. Despite their accomplishments with their children, this family is facing difficult times. Several years ago Agnes, who is now 50, began suffering from mental health issues. The family sought treatment for Agnes and she was placed on medication to improve her condition. Despite this, Agnes is not mentally stable. At times she is abusive and violent towards those around her. She cannot work and her violent mood swings have isolated the family from their neighbors. Albin has continued to work to support the family though his wife’s illness. He is a fisherman by trade, but the work is seasonal and the income unreliable. Now 54, he has increasing medical issues of his own. 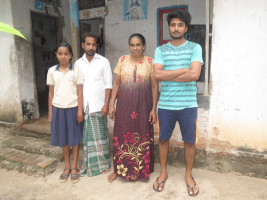 The family owns their own home but it is dilapidated and Albin cannot afford to make repairs. Albin also can’t afford to help Sanju with his education anymore, so the family worries he may have to cut his studies short. Albin and Agnes can see their many years of hard work slipping away. With the help of a sponsor this family could get the medical care and education that will make an enormous difference in their lives.